The Summer Holidays have arrived! The weather is beautiful and the kids are excitable… so bring them along to your nearest Delightful Desserts to indulge! We have a range of new and exciting icecream flavours in to get the kids tastebuds tingling! From candy floss to tutti fruity, they will be in sweet heaven! Our stores are perfect for families and we offer a range of treats for all ages. We have warm mouthwatering British Puds, including apple crumble and the classic favourite sticky toffee pudding. 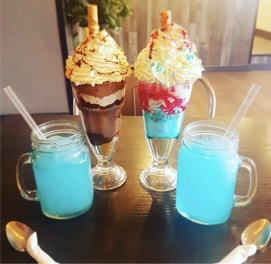 Eat in with our delicious sundaes, or maybe take them away for an afternoon at the park!All our items on our menu are available to be taken away, including our popular creamy milkshakes and delicious waffles! We also have Children’s Choices on our menu! Hundreds and thousands, marshmallows and icecream or maybe go for one of our new fruity options, Bananrama or Sweet Strawb!